Though most coming of age flicks tend to focus on a character's formidable teen years, every now and then this transition into "adulthood" can occur a little later in life. Especially if the protagonist happens to be a typical stunted man-child hell-bent on avoiding any sense of responsibility. Such is the case in 'Adult Beginners,' a sweet yet predictable little dramedy that just manages to stay afloat thanks to a charming cast and a few relatable insights. The plot is very familiar, but the flick's heart and performances are endearingly sincere. Yes, that's right. 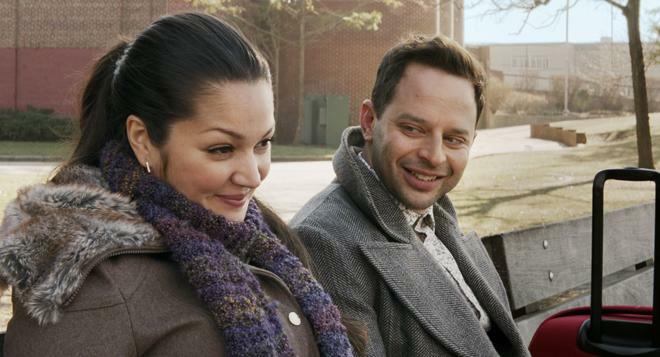 I just used the words endearing and sincere to describe a movie that stars Nick Kroll -- a man famous for playing over-the-top sarcastic jerks with names like Bobby Bottleservice and simply "The Douche." Your interest has to be piqued a little now, doesn't it? 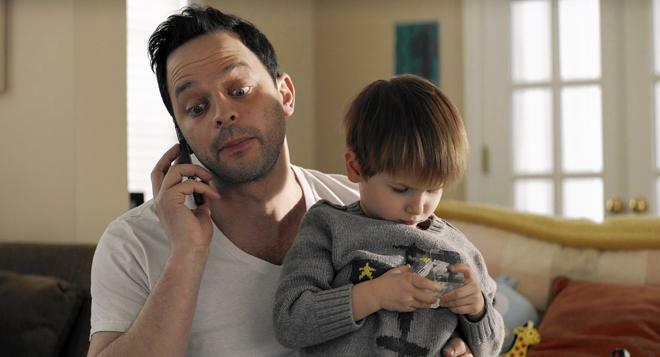 After his company implodes, Jake (Nick Kroll) is left broke and without many options. Hoping to get back on his feet, he heads to the suburbs to live with his sister, Justine (Rose Byrne), and her three-year old son (Caleb and Matthew Paddock). Forced to earn his keep, Jake takes on nanny duties for his nephew, throwing the immature man far into the deep end of responsibility. But as Jake deals with child care, his sister struggles to balance her own life. The siblings will have to find a way to reconnect and help each other grow, or risk sinking under the crashing waves of adulthood. On the surface, the premise sounds a bit like 'Mr. Mom' meets 'Big Daddy,' and indeed the runtime does at times play out in such a fashion. Jake starts out like an average selfish douchebag and predictably starts to grow as a person through his interactions with his family and nephew. To this point, the flick does milk some solid comedy from Kroll's frantic "manny" interactions with his young co-star, finding humor in the man's complete cluelessness when it comes to taking care of a child. A bit involving a rolling suitcase being used as a stand-in for a stroller is particularly amusing. With that said, the script's main emphasis actually isn't on the uncle/nephew dynamic at all. Instead, the movie mostly focuses on the brother/sister relationship, and this proves to be a smart choice. Through Jake and Justine's parallel issues, the film tackles several relatable adult growing pains and stumbles. On one end of the spectrum, Jake is being forced to face responsibility for the first time in his life, and on the other, Justine is being overwhelmed by all of the pressures related to juggling her son, career, marriage, and sanity. Though the two seem to get along fairly well, there is also some pent-up resentment between them, and this conflict boils up nicely as the story goes on, leading to some genuinely affecting drama. 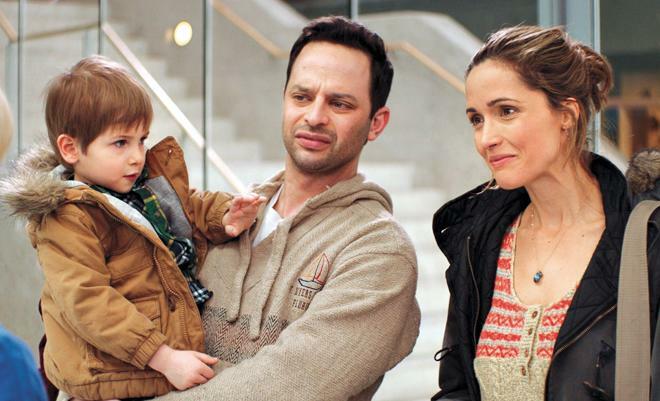 Stars Nick Kroll and Rose Byrne make for a very convincing pair of siblings, and the two performers share wonderful chemistry. Their frequent bickering is appropriately tempered by an effortless air of familiarity and affection, and the way this bond is tested becomes the heart of the story. And while Bryne is as unsurprisingly impressive as ever, Kroll demonstrates unexpected versatility here. The comedian is mostly known for playing outlandish douchebags on sitcoms and sketch shows, and it's quite fun to see him evolve that stock personality into a more fleshed out character. Likewise, Bobby Cannavale is also great as Justine's husband, Danny, adding natural depth to a role that could have become too unlikeable. Bit parts and cameos from Joel McHale, Jane Krakowski, Bobby Moynihan, and Jason Mantzoukas are also memorable, and child actors Caleb and Matthew Paddock remain adorable -- even when they are out of control. Sadly, as strong as certain elements of the film are, one can never quite shake a nagging feeling of "been there done that" throughout the runtime. At the end of the day, the plot is very familiar and though the characters are nicely realized their arcs prove to be predictable and unoriginal. Likewise, despite a few solid insights, the script never quite delves deep enough and the drama relies on many over-used plot points (particularly when it comes to Justine's husband), and formulaic developments. The execution is sweet, but the movie doesn't have a whole lot to say that hasn't already been said better before. A late coming of age movie marked by a great cast and heartfelt emotion, 'Adult Beginners' is a charming yet mostly forgettable little flick. Though there are some worthwhile insights about responsibility, family, maturity, and dealing with the pressures of life, the script is too basic and familiar to really leave much of an impression. But, if nothing else, at least the movie does prove that Nick Kroll's range as an actor can indeed extend beyond mere douchebaggery -- a seemingly astronomical feat that might make the film worth a rental alone. Starz/Anchor Bay brings 'Adult Beginners' to Blu-ray on a single BD-25 disc that comes housed inside a standard keepcase. After some skippable trailers, the disc transitions to a traditional menu screen. The packaging indicates the release is Region A coded. The movie is provided with a 1080p/AVC MPEG-4 transfer in the 1.85:1 aspect ratio. Modest yet nicely detailed, this is a pleasing image through and through. The digital source features a clean and crisp appearance with no major artifacts outside of some minor noise in low-lit scenes. Clarity is strong, offering great fine textures and details in objects, clothing, and characters. Likewise, the video's sense of depth is also solid. The color palette is comparatively subdued but there are some occasional splashes of more vibrant hues. Contrast is balanced well and blacks are deep and inky without crushing. For a low budget flick, 'Adult Beginners' looks quite good on Blu-ray. The picture is free from any major problems and features a nice HD sheen. The film is presented with an English DTS-HD MA 5.1 track along with English SDH and Spanish subtitles. Basic yet effective, this is a solid but unremarkable mix. Speech is clear and well prioritized throughout. The soundstage has a modest level of atmosphere, with subtle ambiance in the rears. Appropriate effects are spread directionally across the front speakers when called for as well, but the track's sense of scope and texture is restrained. An opening party scene, for instance, has only very minimal background clatter and aural presence. Thankfully, the movie's score and music selections feature nice stereo separation and dynamic range. The track can be a tad limited when it comes to immersion, but the modest design work suits the film's stripped down style. The Making of Adult Beginners (HD, 10 min) – Provided in 1080p with Dolby Digital 2.0 sound, this is a sit-down interview with stars Rose Byrne and Nick Kroll, and director Ross Katz. The trio discuss the inspiration behind the story, characters, riffing on set, and elaborate on specific scenes. Though very brief, the are some worthwhile insights. 'Adult Beginners' is a sweet yet familiar dramedy about family and maturity. While the script is very predictable, the cast is charming and the story has a lot of heart. The video transfer is strong and the audio mix is solid. We only get one short featurette, but the insights from the cast are interesting. Though audiences probably won't see anything here that they haven't already seen before (well, besides Nick Kroll playing a likeable character), this is an enjoyable movie that should make for a decent rental.